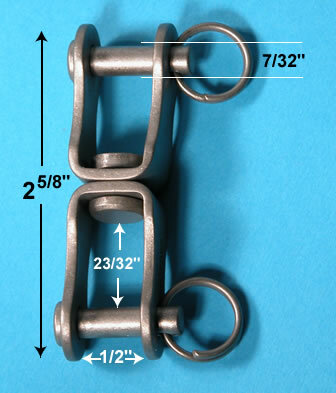 Our titanium Fork & Fork Swivel has ringed pins at each end and of course allows rotation to avoid line twisting problems. Each of our swivels are titanium so they are stronger, lighter and safer than stainless steel and most important, titanium will never corrode, ever! 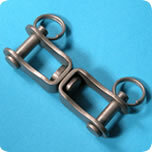 Never replace another swivel due to corrosion! 2-5/8" x 1/2" x 23/32" x 7/32"
Max. Safe Load: 2,646 lbs. Rec. Safe Working Load: 1,323 lbs.